This Amazing Detoxifier Beautifies, Revitalizes, Sweats Away Weight and Inches! The Infraspa Dry Heat Sauna I-SPA is a great value in the world of FIR technology and the fact that it is one of the best sellers is evidence of that. The Sauna I-SPA comes in two sizes (L and XL for people upto 6'5" tall), includes a foot mat to warm the feet, and an auto temperature control which all together provides a very rewarding sauna experience. Its compact size gives you the benefits of beauty, vitality and sense of well-being you would expect from a full-sized (wooden) sauna, anywhere, anytime. 1. Plug Portable Far Infrared Home Sauna into electrical outlet. Ensure the voltage is correct. The power indicator will light, the digital screen shows "OFF". Press "ON/OFF" to start working. If an extension cord must be used, it should be less than 3 meters long. No other electrical appliances should be connected to the same extension cord. 2. After sitting on folding chair inside the Portable Far Infrared Home Sauna, close the zipper all the way to the neck, and close the Velcro strap around the neck. 3. Extend hands outside the sauna through the hand slots to set controls. Press the POWER button once to activate the Portable Far Infrared Home Sauna LED digital display in the display window. Press TIMER button to set for 10, 20 or 30 minutes. The timer will turn on the heater to produce FIR, and will automatically count down to 0 before shutting off power. Press TEMPERATURE button to select temperature. Press "+" or "-" to set, and then press "Function" once more to confirm setting. The temperature screen will show current temperature until the temperature in your infrared sauna rises to the level you have set. Press the FOOT button to turn on the heating element to produce FIR heat on the foot pad. If the foot pad becomes too hot, move feet to the sides or press the FOOT button again to turn it off. Once a thorough sweat has been achieved, turn off the power from the Timer Control Box and cool down. Wipe off sweat from the chair and cushion and disconnect the Portable Far Infrared Home Sauna, for cleaning and storage. Time To Heat 5 mins. 5 mins. Assembly 30 Sec.- 1 Min. 30 Sec.- 1 Min. CERAMIC HEATER: OPTIONAL item, is placed on the foam floor, and works extremely well in very cold weather. It takes only 5 minutes to reach 65 ° C (149 ° F) constant temperature. 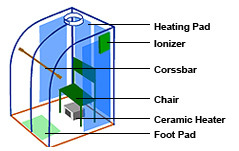 IONIZER: OPTIONAL item, is placed on the sauna tent, and comes with a dial control box . You can adjust time from 0 to 30 minutes.The Ionizer generates a large number of negative ions and some oxygen, just as do nature's ionizers, like waterfalls and lightning. "The Infraspa has really been great for my back pain - because I'm on my feet all day modeling, I get home after work sore and stiff; so the Portable Far Infrared Sauna has become a part of my daily routine, just to relax and unwind." I just ordered the [cETLus-certified] sauna. I had bought another model from another company which was very poorly made. The cheap plastic power supply melted and nearly burnt the house down! "With several hours of intense practice and speed training 6 days a week, my body is always on the verge of muscle pulls whether it is my quads, hams or groin. Using the Portable Far Infrared (FIR) Spa helped me finish an injury-free basketball season for the first time, I know I can always relieve soreness and reduce pain, thanks Infraspa!" "I have to admit I was skeptical when my wife ordered the Portable Far Infrared Sauna, but after just one week of using it for half an hour at a time I felt re-energized. Also after a only a few months, my migraines have reduced while my wife's painful fibromyalgia symptoms have all but disappeared. It an absolutely essential must-have."